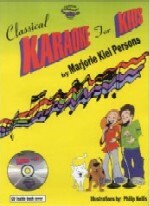 Classical Karaoke for Kids, is a third book with CD covering 37 additional classical music themes. It uses the same format as the other Themes To Remember volumes. In addition to Piano and Forte, this volume also features Adagio, the cat, and Allegro, the mouse, in Haydn’s Clock Symphony. (Of course, Adagio never catches Allegro because Allegro is always faster than Adagio!). 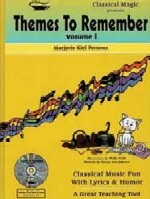 The combination of Themes To Remember, Volumes 1 and 2, plus Classical Karaoke for Kids covers a total of 117 of the most famous classical music themes from 42 composers. What a wonderful way to introduce your students, children and grandchildren to a lifetime adventure with classical music. Love, lovely music for Elise..."
Ringing like bells, Handel’s harmony. Muscles like iron, He’s a sight to see. Now he plays it piano..."
Pachelbel ring out your canon. Beneath the moon and the stars. Sealed in the tomb alive. Who is by his side? Aida! Radames sleeps by the Nile..."
A CD with twenty themes from Volume 1 of Themes To Remember with a music only track followed by a music-with-lyrics track for each theme. Enlarged (8 1/2" x 11") sets of 41 black and white composer portraits are available, including hard-to-find portraits such as Offenbach, Suppé, Smetana, and Joplin.